This will be fantastic! It cannot be overstated how good it was that St. Anthony remained downtown instead of fleeing for the burbs. I'm not a hospital guru, but that looks pretty sweet! Is the heli-pad new to St. Anthony, or a relocation? I believe it's new to St. Anthony. I haven't seen one there before. Kudos to Saints for keeping Kaiser's there AND working around it! Love it. The design looks pretty nice, too. Great news in general but particularly for the Osler hotel project and also the new restaurants that are directly adjacent: GoGo Sushi and Saturn Grill. Their current one is on the top floor of the west parking garage. Not convenient to immediate services. Relocation. They land once in a while on the SW side of the complex (not entirely sure where, but I've seen it go in and out a few times). It almost makes Kaiser's and its wonderful patio feel like a built-in amenity of the hospital. OnlyOne is right about how important it has been for downtown that Saint Anthony stayed. It was really touch-and-go in the late nineties. Fortunately the City stepped up its commitment to the area at the hospital's request, and Saint Anthony lived up to its promise to do the same, contingent upon the City's investments. 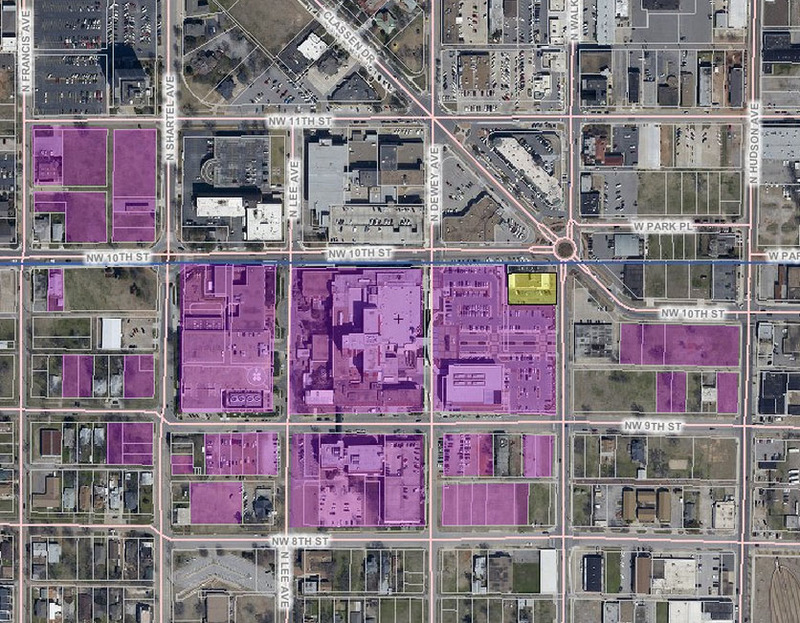 I doubt much if any of the great development and reinvestment we are seeing in MidTown would be happening if SA were missing from the equation. Remember, St. Anthony owns all the properties shown in pink below. Absolutely, this. The most powerful economic development you can do is retaining and growing your existing anchors. How long does it typically take for a project like this to move from being listed on the design review agenda to beginning actual construction? Do they still have to go through a detailed design process or does applying for review mean you already have the plans in place and can begin soon? Detailed construction plans are usually drawn up before submitting, unless there is a preliminary submission in order to gain feedback (like Homewood Suites did in Bricktown). The plans for this project are extremely detailed, so they are probably ready to go pending approval. Thanks for the reply, Pete. Hopefully it will be approved and work will begin before too long. This is very exciting and another great addition to Midtown. What I'm wondering now is if there is still talk of a physician's office mid-rise? If the Osler does well as a boutique hotel (and I bet it's a home run) perhaps we'll see more hotels built in Midtown. I bet we will, especially when the streetcar project gets a little further down the line... Would be cool to stay in Midtown with all the restaurants and nice neighborhoods then take the streetcar downtown for business, conventions, etc. Would also add to the room count for events. I love what is happening in Deep Deuce but I've always thought Midtown had world-class potential in terms of combining charm, history, culture, nightlife, and living. With the fantastic success of everything that has already been completed, you get the strong feeling the area is on the verge of greatness and I think the streetcar will be the thing that pushes it over the top. I would think so. 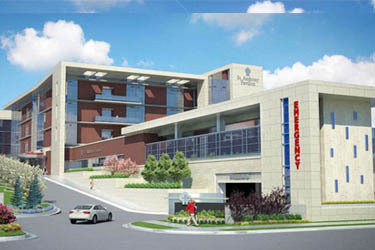 The plans for this addition appear to be ER, ICU and step-down units. A physician's office would still be needed, I think. Well I thought the rumor going around last year was of a private physician's group considering something around 6-10 stories. Something needs to go on the flatiron block immediate across 10th Street from this addition. I had heard that rumor once upon a time as well, but it's been awhile since I've heard anything at all about such plans. You're right about that flatiron block. What sits there currently is an absolute waste of what is turning out to be a prime location. Maybe this will spur a little more housing to the south of St. Anthony now. Looks good. I do wish the side facing 10th was pushed out to the street a little more, but it appears to be landscaped well on that side though with the wall hiding the ambulance ramp. I'm also glad to see they are integrating the site well with Kaisers. I think Lackmeyer even covered it. Some of you guys should ask him about that during his chat tomorrow. I'll bet Kaisers is thrilled to have that big ole cooling tower right next to them. Those can be plenty noisy. Maybe they are trying to be irritating enough to get them to sell. And, by where they positioned it, it could be noise pollution for the immediate area and any outdoor seating. The noise will likely be line of sight to 1212. Hope they have some noise suppression on it.